I’d like to get some advice on the open source that we are working on. The theme is IoT – Pet-Home-Systems, and this system is using a web messenger application:NaverTalkTalk. And this system can feeds, takes pictures, and opens the door when pet’s stuffy using NaverTalkTalk! Using Python’s Flask Web framework, we designed a NaverTalkTalk-Chatbot server and created and implemented Pet Home using Raspberry-pi. – Chatbot: Register according to the user registration form below. – Chatbot: User registration completed! Welcome! If you enter the keyword ” Register[등록]”, ask them to register using the link below, and enter the member information from the link below to notify you that the user registration is complete through a push message. – Chatbot: The ” feed ” function has been received. – Chatbot: tells you. I have completed feeding! If you enter keywords about what you feed, add what you eat to Pet Home on the request list. When you have finished feeding your pet, a push message informs you that it is complete. – Me: And open the door. – Chatbot: The “open” function has been received. If you ask to open the door of Pet Home, you list it on the server. The pet home then performs the opening of the door, and a push message informs you that it is done. This push image is only test image. – Me: Please take a picture for me. – Chatbot: The “camera” function has been received. 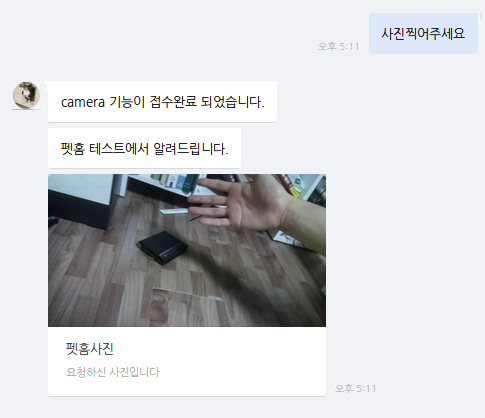 – Chatbot: This is from (Pet-Home-test)[펫홈 테스트]. Pet-home-image / This is the picture you requested. If you ask me to take a picture, I put it in the list. After that, chatbot send a push message with pet-home photo. – Chatbot: It’s been 6 hours since you didn’t open the ‘s house. I think it’s going to be stuffy. – Chatbot: It has been 12 hours since I had to feed the . Wouldn’t it be hungry? After a certain amount of time has passed, the chatbot sends a push message. The camera always watches your pet except for the capture feature. But if you don’t see as many pets as you have set, or if you don’t see any abnormal movements, you’ll send a push notification. There are six major functions, and the function 1 to 4 is to send push message requests directly from the pet home when a user commands a chatbot. In addition, when Pet Home continually sent a Chatbot server (GET), the Chatbot server implemented a list of requests stored in DB to Pet Home. As I am still a student, I am lacking a lot. Nevertheless, I’m sure your evaluation, advice and comments will help us greatly in the process of this project! And if you liked it, I would be even more grateful if you could shoot Github Star!Thank you for reading a long letter while you are busy. This is a video that I’ve taken before, and you can look at it this way.